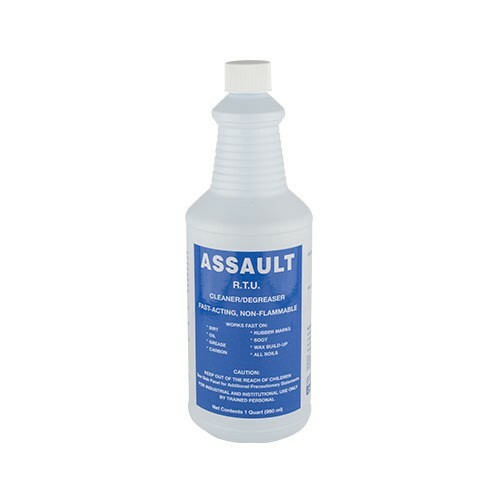 ASSAULT RTU | Pro Chem, Inc. ASSAULT is a fast-acting cleaner and degreaser that immediately removes stubborn, oily and greasy soils from a wide range of washable surfaces. It is an all-purpose cleaner/degreaser that rapidly penetrates and dissolves dirt, oil, grease, carbon, rubber marks, wax, soot and many other resilient soils. Free of fumes and has a natural sassafras aroma that makes it pleasant to use. Contains special rust inhibitors, making it safe for use on metal surfaces. Will not leave an oily film. Ready-to-use – Simply spray and wipe surface. Leaves no residue or streaks. Do NOT use on raw rubber.